Reforms designed to provide consumers with an understanding of how products such as flexible premium universal life policies “work” – and to differentiate guarantees from non-guarantees – have left buyers even more vulnerable to policy-lapse surprises long before their expected life span. This conclusion is the result of multiple analyses of universal life-style illustrations. In fact, most illustrations that advisors are allowed to use almost always bear no resemblance to actual performance. Meanwhile, advisors are caught between the choice of offering more realistic illustrations or losing out to their competitors who may use rosier (but permitted) scenarios that lead consumers to believe they will get the bargain of paying a lower premium, sometimes 50 percent lower. When consumers buy policies under those illusions, the only likely result is disillusion in years ahead. How did reform lead to less clarity and accuracy? First, we have to look at the background. For most of the life insurance industry’s 250-year presence and financial dominance the U.S., policies provided substantial and reliable guarantees. If you paid the premium specified in the policy on time – except for the rare instance of insolvency – the insured death benefit would be paid to the beneficiary upon the insured’s death. In the case of a whole life policy, the accrual of cash value was guaranteed (but dividends were not guaranteed until declared). In the case of a term life policy, the premium usually was stipulated and guaranteed, although it might change as the insured became older. Even through the first 75 years of the 20th century, the life insurance industry wasn’t very innovative nor did it use much in the way of technology. However, life insurance remained a unique asset providing something no other financial instrument could accomplish with guarantees: delivering critical dollars to those who needed it, most often a family upon the death of a breadwinner. But then a small company on the West Coast (ironically, no longer in business) introduced an innovative form of life insurance that soon would shake the traditional life insurance industry to its very core. E.F. Hutton Life began selling flexible premium universal life (UL) in 1977. It became so popular that UL’s market share of permanent life insurance reached 40 percent by 1984. Significantly, each percentage point of market share achieved by UL came directly out of reduced sales of whole life. This was the dawn of creative, “current assumption” policies and the computer-generated illustrations that presumed to explain and, more significantly, to “price” them. Why was this so groundbreaking? It was no coincidence that UL achieved fast sales momentum during a time of historically high interest rates from the mid-1970s into the mid-1980s. It also was no coincidence that UL grabbed market share with the introduction of the personal computer in virtually the same time period. Early computer-generated UL policy illustrations incorporated current, non-guaranteed crediting rates as high as 14 percent. Problems arose in responding to the age-old consumer question of “What’s it gonna cost?” for a policy that was based on such a high rate and that had no scheduled premiums or timing of when premiums were to be paid. A healthy 35-year-old woman would have been advised that her $1 million policy could cost barely $2,000 a year. Her understandable mistake, and perhaps the mistake of the agent as well, was to assume that the 14 percent crediting rate would persist throughout her lifetime. The mathematically correct (but practically impossible) calculated premium was only temporarily sufficient. If she were lucky, she would have realized this was too good to be true and would have increased her premium periodically as interest rates steadily declined over the next 30 years. If not, within just 10 years, that $2,000 annual premium would need to triple to $6,000 a year in response to declining policy crediting rates. With further interest rate drops, the annual premium would need to be increased again to $10,250 as of her 55th birthday if she wanted reasonable assurance the policy would “last” longer than she would. In today’s low interest rate environment, in which such a policy is likely to achieve only the guaranteed minimum crediting rate, her policy at age 62 would require yet another increase in annual premium to $15,500, but by now that policy likely would have been replaced with a promise of a “new and improved” policy. In fact, replacement became so rampant with UL and its evolution of variations, that it’s estimated that 30 to 50 percent or more of “new” policies sold in the past 30 years may well have been replacements for “failed” policies. Pressure increased within the “traditional” (whole life) portion of the industry to do something to tame policy illustrations. By 1995, the National Association of Insurance Commissioners (NAIC) was gathering consensus and direction for regulations that would contain both rampant replacement and the projection of values that were very unlikely to materialize in the policy for which the illustration was merely a marketing device. NAIC Model Illustration Regulations were adopted for implementation by the states starting Jan. 1, 1997. By the end of 1998, all 50 state departments of insurance had adopted the substance of the NAIC’s model for illustration reform. Before regulation, universal life illustrations generally wove their expectations in three to four pages. With regulation however, we often deal with a computer-generated pack of 18 to 30 pages consisting of arcane narrative and lengthy streams of numbers that would make even Stephen Hawking flinch. Before reform, carriers were generally free to project crediting rates, bonuses and expenses without a rigorous relationship to reality. For example, an insurer could include in its current assumptions the circular logic of an expectation of substantial early-year policy lapses – and illustrate numerical results that could not possibly be achieved if those lapses didn’t occur. If the projections were substantial enough – why would anyone lapse? With the new regulation, carriers were held to much tighter standards. For example, regulations required an “illustration actuary” to annually certify the reasonableness of future expense projections. Illustrations were to provide expanded narrative, as well as to format its numerical projections about guaranteed results completely independent of projected, non-guaranteed results. Also, in the case of a whole life policy or a current assumption policy, amounts paid to insurance companies on behalf of policies were to be referred to as “premium,” even though a premium on behalf of a whole life policy is fully guaranteed, while the “premium” for a universal life policy has virtually no guarantee associated with it. While all of the elements of illustration reform were intended to aid the consumer in better understanding the policy she or he was buying, it inflated the volume of pages, narrative and columns of numbers without necessarily adding to the consumer’s ability to truly understand how current assumption policies would work when the assumptions invariably did not “show up” as portrayed in the original illustration. Turning to the selection of appropriate styles of lifetime life insurance based on something other than the illusion of “best price,” it would seem logical that a prospect’s conservative investment attitude would inspire whole life to be the preferable policy choice, especially with respect to an aversion to risk (and wanting little or no policy management responsibilities). In that same context, if a balanced risk tolerance points to UL and the acceptance of some policy management duties – and aggressive risk tolerance points to variable universal life (VUL) and ongoing active sub-account and policy management – what would we call the risk tolerance that seeks only upside and no downside? Perhaps the term passive aggressive risk tolerance best describes this new style of policy, and perfectly matches the opportunities touted for indexed universal life (IUL). Unlike its variable UL cousin – in which policy owners direct how their premiums should be invested in a range of offered equity and fixed “sub-accounts” – IUL insurers still invest in very conservative bonds and other high-grade, fixed-return assets. The policy’s “credit” comes from sophisticated hedging of policy premiums in excess of what’s required to guarantee (typically) a 0 percent return on its reserves underlying these policies. This is true even though the main attraction is the appearance of an opportunity to participate in a portion of gains in “the market,” while not suffering market losses. Clearly, this is an appealing approach to buying life insurance. Over the past 25 to 30 years (and in spite of the downward thrusts of equity returns in 2000-2002 and 2008-2009), it is not uncommon to see IUL illustrations assume a “long-term average” of 8, 8.5 and even 9 percent, even though the dividend component of the S&P 500 Index is excluded. Yet, whatever the rate used in a specific IUL and even VUL illustration, it is always incorporated in illustration calculations as a constant. Understandably, policy illustrations are unable to suggest likely, real world outcomes when constant crediting rates are projected 30 to 50 years in the future, and when those crediting rates depend on volatile elements, which will cause the rate to go up and down and instead of being constant. 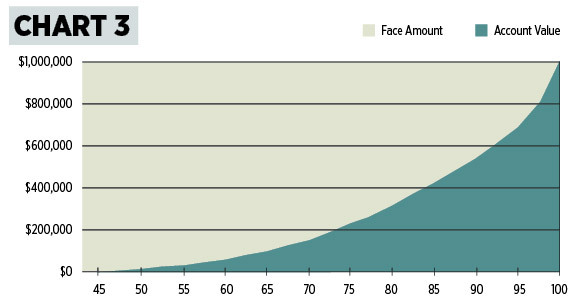 Although average rates of return in an accumulation scenario do not depend on the order in which the returns show up to reach a particular value in the future, life insurance is constantly “de-cumulating” through its monthly expense charges while attempting to accumulate through the underlying source of its crediting rate. Charts 1 and 2 demonstrate these differences. 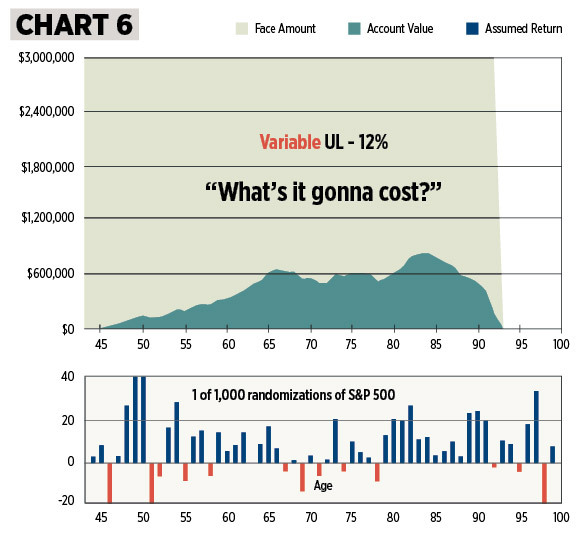 In Chart 1, the upper and lower scales – in red and blue – are mirror image annual returns, both sets of which have a 7.2 percent compound rate of return over 10 years. They will accumulate to the same value even though the lines cross back and forth while “getting” there. 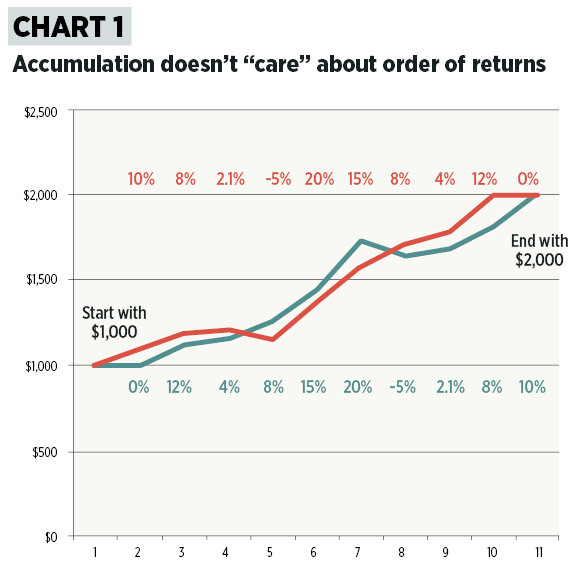 Chart 2, however, is an example of distributing $100 a year out of an initial $1,000, and we see that the order in which returns “show” up does matter. This is true even though the average compound return on each scale is the same over the 10-year period through its “mirror image” returns. Typical insured lifetimes of 30-50 years, and increasing mortality charges over that time, will greatly exaggerate the de-cumulation effect in UL-style insurance policies, especially with minimum “best price” planned premiums. Because volatile returns can produce different results in this simple example, it would be important to model volatile returns in VUL and IUL illustrations to see the degree of variance from the constant assumptions that underlie regulated policy illustrations. 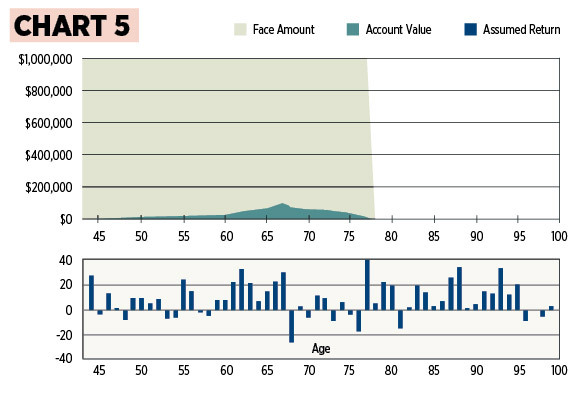 Chart 3 is a graphic visualization of the data points derived from a VUL illustration when it is used to calculate a lifetime annual planned premium in response to the question: “What’s it gonna cost?” Notice how the illustration produces the theoretical perfectly smooth accumulation of account value from $0 in the first year to virtually the dollar amount of the death benefit at age 100 based on the calculated premium of $4,062 for a healthy 43-year-old woman, using the allowed 12 percent gross return. Also observe that only in such a graphic depiction can we visualize what the 18-page stream of columns of numbers is trying to tell us. A picture is indeed worth a 1,000 words. But because equity sub-account returns do not materialize in any constant way, we need a means to both visualize and assess the potential effect of the volatility. Fortunately, that means is readily at hand, and is commonly used in portfolio management and retirement plan distribution assessments. It is a statistical process called stochastic analysis, more popularly referred to as Monte Carlo analysis. With it, we can set aside the use of an arbitrary rate of return, and focus on using the client’s chosen asset allocation. If we assume the response is for an aggressive risk tolerance, in turn pointing to an all-equity election of sub-accounts, we might randomize historic monthly S&P 500 returns from the past 40 years as a reasonable proxy of both volatility and realistic returns within that asset allocation. 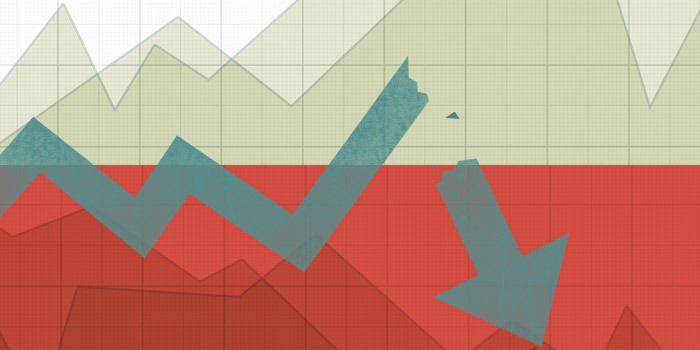 When this statistical process is applied to 1,000 such randomized illustrations focused on the $4,062 planned premium, we might first take a peek at an individual but randomly generated result and a randomly generated hypothetical illustration that closely resembles the results of the bull market of the ’80s and ’90s in Chart 4. But with a “click” on the control of the randomization engine to generate another random scenario of monthly historic returns (and actuarially determined expense factors), Chart 5 is typical of the result. 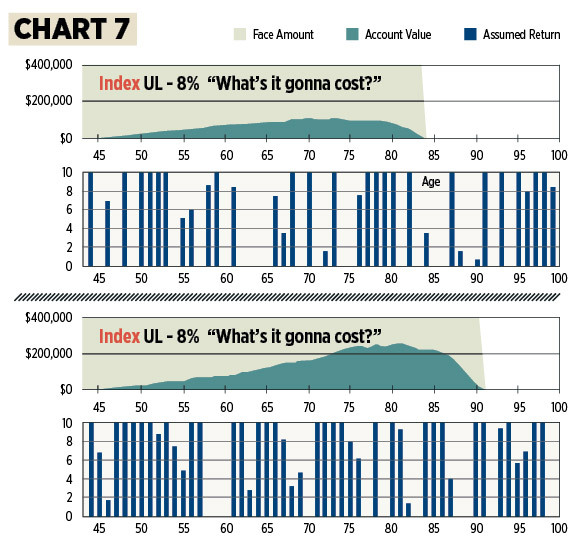 And even in a random scenario that has only 13 “down” years and 45 “up” years – and for which there are significant “up” years – Chart 6 shows how, in reality, VUL’s long-term results can turn out to be substantially less than illustrated when approaching the answer to “What’s it gonna cost?” with a “best price” mentality and a high constant return assumption. When all 1,000 hypothetical illustrations are run and a tally is made of the number of illustrations that sustain to age 100 with the underlying $4,062 VUL planned premium, we find that only 100 out of 1,000 meet our expectation of “success.” If a 10 percent chance of success would be unacceptable in the purchase (and determination of premium) of life insurance for the protection of our loved ones, we could turn it around by asking the client, “What would be an acceptable success probability with respect to this type of life insurance policy?” If the answer is an understandable “100 percent,” the resulting calculation of a planned premium that will fulfill that requirement (and rather than simply using a fixed average return) leads to a reverse engineered $11,600 planned premium that finds virtually all 1,000 hypothetical illustrations sustaining to age 100 and beyond with randomized returns in the client’s chosen asset allocation. A lower required success probability (we wouldn’t expect a client to be comfortable with less than 80 percent) could be achieved with a somewhat lower planned premium. A 90 percent threshold suggests a $7,425 planned premium and an 80 percent threshold suggests $6,575. At least now we can relate “What success probability do you need out of the relationship of a planned premium and the likelihood of success?” to the rational approach toward estimating an initial planned premium. This is in contrast to the irrational use of a constant rate of return for a policy style that will achieve anything but constant returns in the deployment of its chosen asset allocation. Given the experience of most investors in the 2007-2009 bear market, and the extremely low fixed returns that have dominated the bond market for the past five years, insurance buyers needed a different solution for their long-term insurance needs if their requirement was premium payment flexibility (current assumption) rather than guarantees (whole life and no-lapse guarantee). IUL was developed to protect against equity losses while providing some participation in equity gains. But while volatility occurs in a much narrower range than in VUL, volatility can still produce a very different result than the policy illustration, especially when the objective is a low, lifetime annual premium. Instead of the idealized “perfect” graphic image of an illustration whose $5,417 planned premium is calculated based on IUL’s often-allowed 8 percent average crediting rate, Chart 7 depicts two random results with annual credits ranging between the guaranteed 0 percent minimum and a 10 percent “cap” with 100 percent participation (i.e. in a year in which the index return is 14 percent, the most that will be credited to the policy is the “cap” as determined by the formula 10 percent cap X 100 percent participation = 10 percent credit). 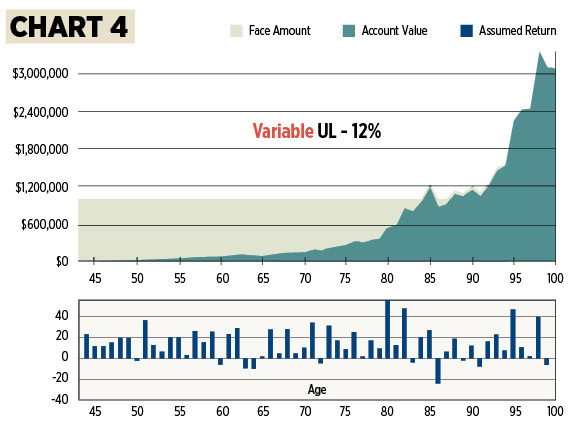 When all 1,000 randomized hypothetical IUL illustrations are run and the 0 percent minimum and 10 percent cap are imposed on outlying returns, we find that only 1 in 1,000 are able to sustain to age 100 with a premium of $5,417. Similar to the example with the VUL hypothetical case, when we solve for 100 percent probability of success, we discover that the IUL planned premium should be set at least initially at $10,735 rather than $5,417. This is almost twice that was determined in the conventional, average rate of return process that is required by illustration regulations. But if we choose to overcome the urge to use the highest crediting rate to produce the lowest “premium,” we can start instead with the more sophisticated approach, and then fine-tune the determination of the initial planned premium as experience and actual market returns “show up” over the ensuing years of policy management. It should be obvious that the variability in future planned premium adjustments will be far less with this approach, as compared to the use of a high constant rate to arbitrarily make that premium look as low (although improbable) as possible. My approach is both conceptual and practical. We know that we can work only with the client and deal with the regulated and “signed” illustration. However, it is still up to the advisor to pick an appropriate interest credit rate within the range allowed by the illustration. The illustrated solution covering the client’s best interest is to choose an interest crediting rate that has a high probability of sustaining the policy for a client-determined length of time (often age 100). The agent can run an illustration that solves for lifetime premiums sufficient to sustain the policy to age 100 with the illustration’s highest allowable rate, producing a relatively low planned premium. She then can run a second illustration that solves in the same manner, but with a crediting rate that is at least 250 basis points lower than the originally illustrated rate. 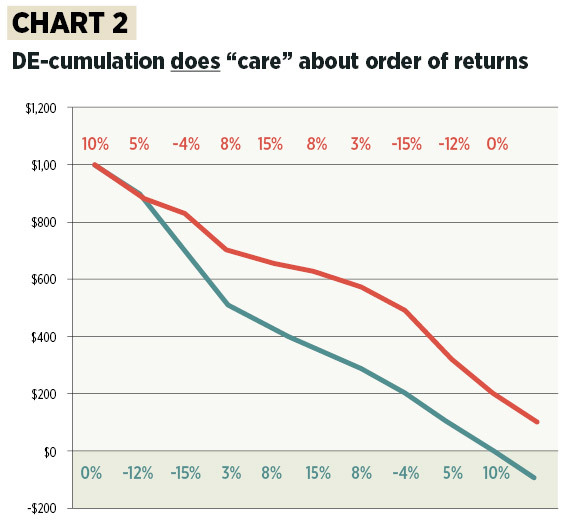 Use those two illustrations to help the client understand that while $5,417 is clearly the best looking number, in reality it is very unlikely that actual, credited returns always will be simply 8 percent (or whatever the higher illustrated crediting rate). The use of a crediting rate at least 250 basis points lower typically produces an initial calculated planned premium that more readily will compensate for the natural volatility of the S&P 500. Real World - How do I Make These Calculations? Members of the Society can download a tutorial and the program at www.FinancialPro.org/HVC. Not withstanding an expectation of more precision in the calculation of a planned premium with the methodology described in this article, Monte Carlo technology and the application of product standards does not and cannot predict the “right” premium for any policy, nor does it replace the regulated policy illustration! Advisors will not win the “price” competition with this approach. We must help our prospect or client understand why price does not equal value. Policy illustration examples in this article are generic. For IUL, we are often asked, “Why not a 12 percent cap? Why not 140 percent participation?” The answer is that we’re attempting to help the advisor and the client appreciate the underlying concepts, and the cap and participation factors may change in the future. Since almost everything about VUL and IUL can be changed on an in-force policy – we would rather “under-illustrate” the process of setting initial expectations. VUL and IUL policies need to be actively managed. Only a policy’s experience with factors driven by unpredictable returns (and expenses) will allow us to provide subsequent “mid-course corrections” for the benefit of sustaining the underlying policy for all years, with optimal outcomes. Registered representatives reviewing or selling a VUL policy, or a producer reviewing or selling an IUL policy, and using such tools as the HVC for in-force management or new sale determination of a funding premium that can reasonably meet the client’s expectation, will need to discuss the use of the information derived from such tools with their compliance department. That said, use the recommended “discount” of at least a 250 basis point reduction in crediting rate for the purpose of calculating a planned premium for IUL. If you are a member of the Society of Financial Service Professionals, use the HVC’s lower “average return” calculation to better inform and serve you with a better approach to calculating a funding premium. We anticipate a favorable compliance reaction when an advisor picks an appropriate and lower crediting rate to compensate for volatility that isn’t otherwise accounted for by the regulated illustration. A guarantee of no negative returns is not the same as a policy that cannot lapse. As we’ve seen, current illustration technology can’t readily explain this IUL reality. Policy illustrations have evolved to help consumers better understand how the underlying policy would work under the extremes of an unrealistic “guarantees-only” result, and an equally unrealistic “current, non-guaranteed” calculation that is the simplistic result of projecting a user-selected crediting rate as a constant over the many years of expected policy benefits. Neither extreme is a realistic representation of a likely future, nor can the 15-year old technology of producing illustrations really lend itself to helping the client make decisions that are in their better interest. VUL illustrations were left out of the last attempt at illustration reform, and IUL policies and their illustrations weren’t even contemplated 15 years ago. Because policy credits on behalf of VUL and IUL styles of current assumption universal life depend on volatile – not static – returns in sub-accounts or indices, producers and their clients need better ways of communicating and understanding how to set a reasonable expectation for “What will this policy cost me?” and the resulting need for ongoing management to optimize the benefits of whichever type of universal life policy the client may choose to own. In the era of annual “new and improved” iPhones and Android device upgrades, policy illustrations, especially for universal life-style policies, are long overdue for their own version of a technology upgrade.